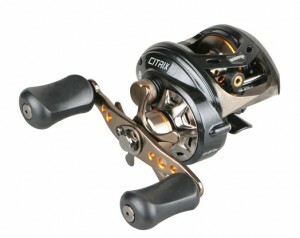 Bass fishing can be a fun and relaxing way to pass a lazy afternoon with your Citrix Low Profile Baitcaster Reel. Why not try night crawlers for a change? 5. And of course.. a fishing rod! 1. Tie the sinker above the hook (distance depends on water depth and flow) before you tie the hook. 2. Now, use whatever strong knot you know to attach the hook at the end of the line. 3. It’s time for the night crawler! Hook the night crawler about one inch from the head end and slide it all the way to the top of the hook. Next, put the hook through the body again about an inch further down. Let the rest of the worm body dangle so it creates some movement in the water. That’s it! You just made a night crawler rig for bass fishing. This entry was posted on Tuesday, March 8th, 2011 at 11:12 am	and is filed under Baitcasting Reels, Fishing Equipment. You can follow any responses to this entry through the RSS 2.0 feed. You can skip to the end and leave a response. Pinging is currently not allowed.